We provide pet waste pooper scooper service in the following Areas: New Orleans, Metairie, Uptown, Slidell, Covington, Mandeville. If you do not see your city listed, please give us a call. We can service your pets yard as well! Do you service Commercial accounts as well as Residential accounts? Yes! If your business or community has public areas that are host to pets, we can help keep those areas clean with our pooper scooper service. Our commercial clients include vets, homeowners associations, businesses, private schools and others. Please contact us to discuss options for Commercial pet waste removal. How often does your company service our yard? Most of our customers prefer pet waste removal service once a week. We also offer our twice a week and every other week services. Yes. Dogs keep making their messes all year long, and our company continues to clean up and remove dog waste through winter. Our company will usually work in the rain. A very heavy rainfall may stop us, though. We will most often be able to make up the work later in the week. If we can't make it up you won't be charged. When a holiday falls on a regular service day, we will usually be out there the following day. Service returns to the regular day the following week. Yes. Since technicians are not to climb or jump over fences, please have your gate unlocked on your pooper scooper service day. You may provide us with a key to the lock or tell us the combination if that will be convenient for you. If a gate is locked when we arrive and we cannot perform the pet waste service, a charge is still incurred. We will be out the next week and remove the double pet waste accumulation. Can you work with our dog in the yard? In most cases, yes. We get along well with dogs; however, there are some cases when a dog will not let our worker into the yard to perform pooper scooper services. If you know that your dog is not good with strangers, or it becomes apparent that your dog will not allow us to clean the yard, then we ask that you restrain or confine the dog. We don't want to take any unnecessary risks with your dog or our employees. You will not be charged if you call the company office in time for us to tell the service technician to skip your yard that day. If the dog will be gone from the yard for a couple of weeks, or for some other reason you want us to skip your yard for a day or more, we can hold service and you will not be charged for those days. However, if your gate is locked or the dog will not allow us to clean the yard when we come to do the work, it may be necessary to charge for the service call that could not be completed. If, for instance, you get to work and remember that the gate is locked, call us early to tell us to skip that day so that you will not be charged. How do I pay you and can I pay with a credit card? We will send an invoice through e-mail on the 1st of the month for the previous month's services. You can pay with a credit card through the stripe link at the bottom of the invoice. We also offer recurring payments. There is a $10.00 late fee for accounts not paid by the 15th of the month. No. We can start and stop your service over the phone. We do not require contracts, there is no minimum service period, and there is no advance notice required to cancel service. Try out a clean and healthy yard for a few months and we assure you that you will be hooked! There is an extra charge of $30 for the first time service due to accumulated pet waste over time. This charge is added to the regular service rate for the day. Sure! 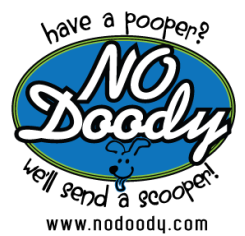 One-time-only, or short-term pooper scooper service may be easily arranged. THANK YOU FOR YOUR DOG'S "BUSINESS"!